LOCATION The columbarium is located in the corner of a large recently completed meditation garden located outside the church sanctuary. The walled “Sacred Hoop Garden” is dedicated to Native American religions and has native plants used by the Huchiun people that once lived in this area. ELIGIBILITY Anyone wishing to inter the cremains of a loved one may apply. Northbrae Community Church is an independent church without affiliation with any denomination or other religious organization. Our columbarium is intended to serve the communities of the East Bay - Berkeley, Albany, Kensington, El Cerrito, Richmond, Oakland, but everyone is welcome. NICHES The columbarium currently includes 80 individual niches with space for an additional 240 niches in the future. Each niche is 5” x 5” x 16” deep. A granite cover plate is engraved with the name and date of birth and death. A custom stainless steel urn is provided for each niche. The buyer can select the niche in order of purchase date, once the initial payment is received. PLAQUES For those who have other burial arrangements but want to be remembered in this North Berkeley area, a 6” x 6” bronze plaque can be purchased. 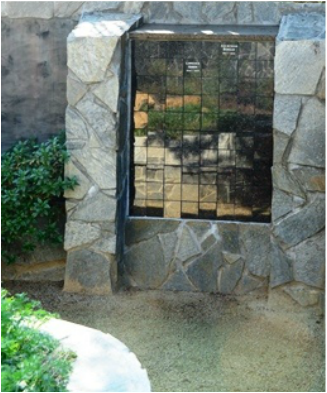 The plaques are located on the stone wall adjacent to the columbarium. COST The cost of a niche is $5,000. Of this amount $4,485 Is a tax deductible donation to the church. The cost of a plaque is $1,500. Of this amount $1,300 is tax deductible. The cost of a niche includes one urn, opening and closing of the niche for interment, the niche cover plate and its inscription, and perpetual care. The cost of cremation and filling of the urn is not included. Niches can be prepurchased. Payment can be made with terms over a time period not to exceed three years, but full payment must be received before the interment. INTERMENT CEREMONY A simple ceremony to inter the urn in the niche is included. Norhtbrae Community Church can provide memorial services separately from the interment, as arranged with the minister. PROCEDURES AND RULES Interment of cremated remains is a legal proceeding governed by a number of State regulations. A member of the Northbrae Columbarium Committee will provide guidance from the time we are contacted until this interment is complete. We will provide the necessary forms and assist with their completion and filing. The buyer must agree to a set of written Rules and Regulations provided by Norhtbrae. The columbarium is administered by the Columbarium Committee under the authority of the Norhtbrae Church Council. Permanent records will be kept at the church. We hope you will consider this simple, elegant, sacred garden, this island of peace in our busy neighborhood, where you or your loved ones can be remembered in this special and historic location.